Urinary tract infections in dogs can occur in three different places of the urinary tract - the lower urinary tract (below the bladder), in the bladder, or above the bladder (in the kidneys). If the infections that occur in the lower urinary tract are not properly treated in time, they can spread upward to the kidneys, causing serious life-threatening problems. Female dogs are especially susceptible to urinary tract infections because of their short urethra. To protect your female dog from urinary tract infections, the best way is of course to keep her clean. Wipe her down with a baby wipe after urination to get rid of the bacteria. 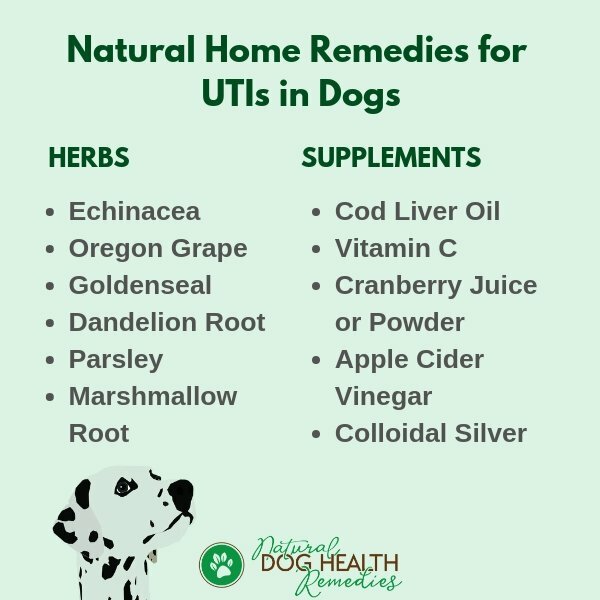 What are the signs and symptoms of dog UTIs? Peeing in inappropriate places, such as on the couch, on his own bed, etc. To properly diagnose dog urinary tract infections, take your dog to a veterinarian for a urinalysis and possibly other tests, such as X-ray (to rule out the possibility of bladder stones). 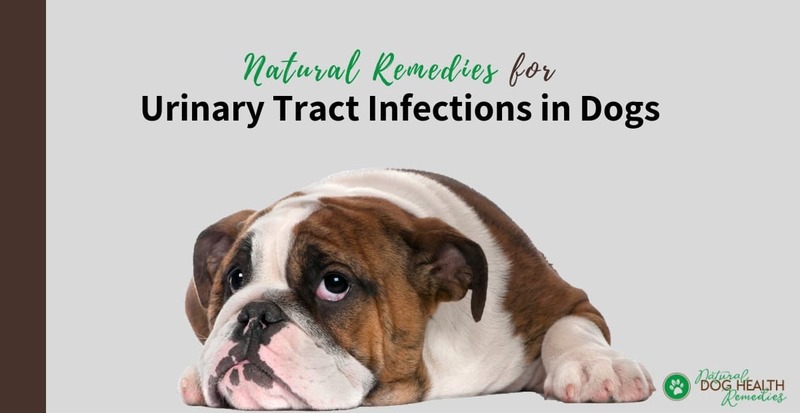 Dog UTIs are often caused by different forms of bacteria, fungi, or parasites that somehow have gained access to, and multiply in, the urinary tract (bladder or urethra). It is not easy to determine exactly where the dog gets the infection from. Sometimes it can be from the skin, or it can be from the dog lying on a contaminated environment. Bacteria thrive in an alkaline environment. The urine of a healthy dog normally has a slightly acidic pH level (6 to 6.5) because dogs consume meat, which makes the urine slightly acidic. So for dogs whose diet is meat-based, their urine environment is hard for bacteria to survive. On the other hand, if a dog is fed a grain-based diet, his urinary pH will become more alkaline, making it much easier for bacteria to grow and multiply. So you can see that an improper diet is often the cause of dog urinary tract infections, can't you? That's why if your dog suffers from chronic urinary tract infections, be sure to take a look at his diet. Feeding your dog a higher-protein, low-carbohydrate, grain-free diet may create an optimal urinary pH level (6 to 6.5) that bacteria find it hard to thrive. The urine of healthy dogs normally is slightly acidic (pH 6 to 6.5). Bacteria overgrowth: An overpopulation of bacteria in the urinary tract can result in an infection. Inflammation of the bladder (cystitis): A bladder inflammation predisposes the dog to a bladder infection. Urinary Crystals and Stones: Chronically acidic urine often results in urinary crystals, sometimes stones. When the urine becomes alkaline, minerals can settle out of the urine to form crystals which are sharp particles that roll around in the lining of the bladder. This can lead to irritation and inflammation of the bladder. Crystals can cohese together to form stones. Maintaining a healthy urinary pH is therefore important - not only to avoid urinary tract infections but also inflammation and formation of crystals and stones. You can use a pH paper strip to test your dog's first urine in the morning. 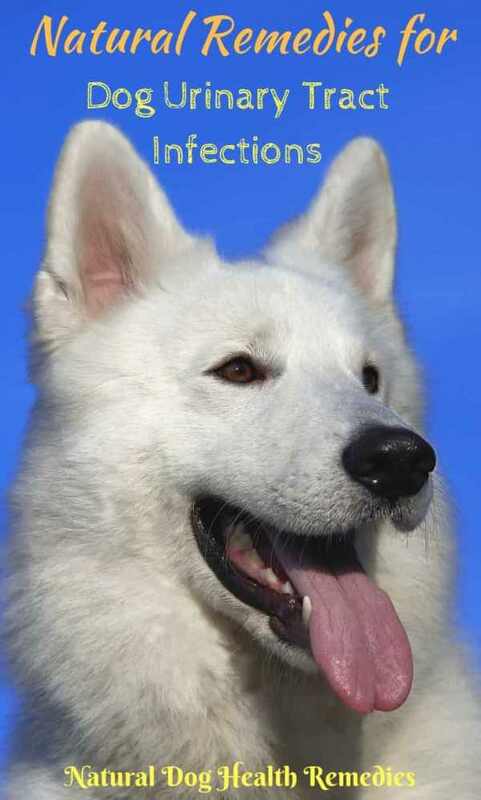 If it reads over 7.5, your dog's system is on the alkaline side. In that case, consider adding apple cider vinegar to his drinking water. Conventional treatment is the use of antibiotics to kill off the bacteria. Natural remedies such as herbs are equally effective (and better for your dog's health). For this purpose, use herbs that are antibacterial such as Oregon grape, echinacea, goldenseal, or garlic can be used due to their antibiotic properties. To this end, use herbs that are diuretic, such as dandelion root. It is a strong diuretic and it stimulates the urinary organs. Other effective herbs are nettle, parsley, and juniper berry. These herbs are diuretic and at the same time antiseptic. Marshmallow root is the herb of choice for this purpose. It is safe and contains mucilage that coats internal mucous membranes. In addition, it is antimicrobial and immune-stimulating as well. This natural herbal formula uses herbs such as marshmallow, dandelion, echinacea, and more, to effectively eliminate the infection, stimulate urine flow, and soothe the bladder. This natural herbal formula contains herbs effective for treating urinary tract infections, such as juniper berry, parsley, marshmallow root, ginger root, and goldenseal. It is designed to protect, soothe, strengthen and rebuild the entire urinary tract. 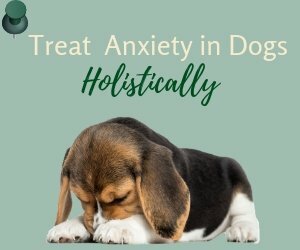 The product is specially formulated with homoepathic and herbal ingredients to safely and effectively treat the causes and the symptoms of urinary tract and bladder infections in pets. Cod-liver oil: The vitamin A in the oil will keep the lining of the bladder and urinary tract in good condition. Vitamin C: Vitamin C can acidify the urine which in turn helps control bacterial infection. Vitamin C is also great for the lining of the bladder because it is a natural anti-inflammatory. Cranberry juice or powder: Cranberry is shown to be effective in preventing cystitis in animals (and people). Cranberry helps keep bacteria from adhering to the lining of the bladder and the urethra. If you want to feed cranberry juice to your dog as a preventive measure against urinary tract infections, remember to use the non-sweetened juice (about half an ounce for dogs). You may find it easier to get some cranberry powder (in capsules) and mix 1/4 of a teaspoon of the powder with your dog's food. Apple Cider Vinegar: ACV is another good remedy for UTIs in dogs due to its acidity and anti-microbial properties. Mix 1 teaspoon to 1 tablespoon (depending on the dog's size) with some plain yogurt and give it to your dog. It can help control and prevent UTI infections. Clean Water: Yes - clean filtered water is essential in battling urinary tract infections in dogs. If your dog does not drink enough water, she will not urinate a lot. This allows the bacteria to fester in the bladder and the urinary tract. If your dog does not drink enough water, try adding some water to her food. Always make sure your dog has access to fresh, clean water. Giving your dog filtered water is preferable because it helps flush out impurities and toxins and does not contain chemicals like tap water. Feed your dog a natural, healthy meat-based diet. Stay away from low-quality kibbles which are usually packed with cheap, grain-based carbohydrates which can alter the pH of your dog's urine, creating an environment that encourages the development of dog UTI and other urinary issues. Give your dog plenty of regular exercise and play-time. It has been shown that daily exercise reduces stress which in turn reduces infection, inflammation and disease. Walk your dog at least twice a day. Make sure your dog has access to the "toilet" (wherever it may be) so he can urinate as needed. If his toilet is the yard, consider installing a doggie door if you are not always home to let your dog outside. If your dog goes to the toilet indoor, make sure that the "pee wee pad" is clean before you leave home for work. Incontinence is another rather common urinary problem in dogs.